Can I select all the threads in a 1:1, Group or Chat room? Yes. Start by going back in history and load all the text messages you wish to copy by scrolling to the top of the thread and then click inside the chat thread. 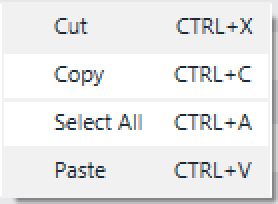 From the Amazon Chime for Windows client, click inside the thread and use either “ctrl + A” or right click and choose Select All. Amazon Chime will select all message threads that have been loaded. The threads will be saved onto the clipboard and available to paste.